From Flour Power City Bakery, London. 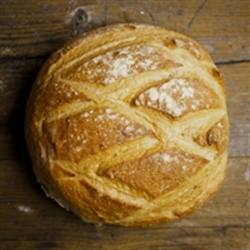 A traditional French country bread, made with 5% light rye flour for added flavour and texture. Ingredients: 95% Organic Strong White Flour, Organic 5% Rye Flour, Water, Yeast, Salt.